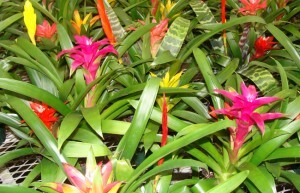 Bromeliads are awesome indoor plants that come in many shapes, sizes and colors. Some are attractive for their flowers and others are unique in their foliage. They are extremely tolerant of low-moisture conditions and will survive prolonged periods of drought. While they prefer bright light they will tolerate lower lit conditions. We carry these plants all year round and have a large selection including SILVER VASE, GUZMANIA’S (many different colors) or a BROMELIAD GARDEN which has smaller assorted varieties in a pot.